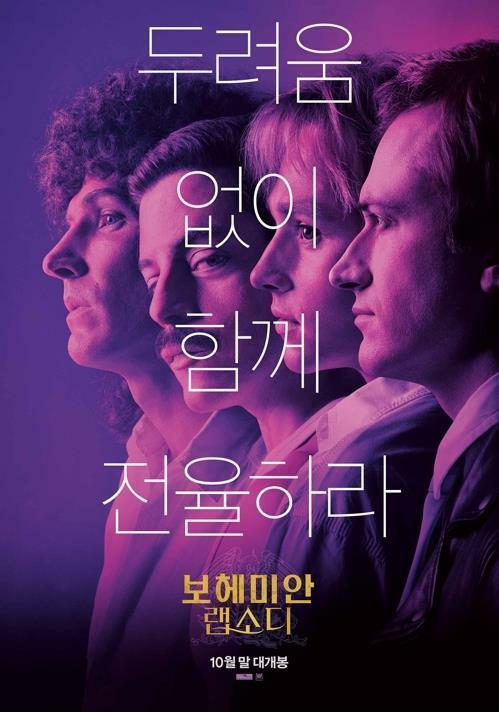 "Bohemian Rhapsody" reclaimed the top spot on the weekend box office chart in its eighth weekend in South Korean theaters. The Queen biopic, which stars Rami Malek as legendary frontman Freddie Mercury, sold 553,807 tickets from Friday to Sunday, data from the Korean Film Council showed Monday. The film's cumulative audience reached 7.94 million. After debuting at No. 2, the movie first topped the chart in its fourth weekend. It fell to second place after the release of the Korean drama "Default" on Nov. 28 but reclaimed the throne backed by the worldwide popularity of the music biopic. "Default" took the second spot with 464,301 admissions. Directed by Choi Kook-hee, the CJ Entertainment release looks back at a difficult time for South Korea, when the country was on the verge of bankruptcy during the 1997 Asian financial crisis. It stars Kim Hye-soo, Cho Woo-jin, Yoo Ah-in and Huh Joon-ho. French actor Vincent Cassel plays the role of the managing director of the International Monetary Fund. "Door Lock," starring Kong Hyo-jin, came in third with 326,724 views. The South Korean thriller follows what happens to a woman who lives alone in a studio apartment as she finds evidence that someone has broken into her home. The new animated Hollywood feature "Spider-Man: Into The Spider-Verse" debuted at No. 4 drawing 298,172 moviegoers.